Whenever you’re looking for trade show conference meeting rooms near Manheim, PA, it’s easy to become overwhelmed with the number of options that are available to you. There’s no reason for you to feel that way, however, because Spooky Nook Sports is designed to handle trade shows, conferences and business meetings of any size. Our facility has 700,000 square feet of event space, which can be configured to suit the unique needs of your upcoming trade show. Whether you want to have a certain number of booths in one area and/or multiple spaces for breakout sessions, we’ll customize our event space in accordance with your specifications. Your guests will enjoy ample, accessible parking and a warm welcome from our friendly, professional staff. Your trade show’s attendees won’t have to worry about how they’ll keep their mobile devices powered up because we have plenty of power sources available for charging stations. We offer a number of dining options in our trade show conference meeting space near Harrisburg, PA. Whether you want to serve full-plated meals, go buffet style or just want to provide some free snacks at various locations in the event space you rent, our executive chef and banquet staff can develop a menu your show’s attendees will enjoy. Your guests can also grab some food and beverages at the food court and smoothie bar located inside of our facility. Forklift & Palate is conveniently located on our campus for attendees who want to savor classic American fare prepared with a modern twist. If you’re concerned about overflow during your trade show, you’ll be happy to learn that The Warehouse Hotel also shares our campus. The Warehouse Hotel has 135 rooms and suites where people can relax and network in a comfortable environment after a day of participating in your trade show’s events. 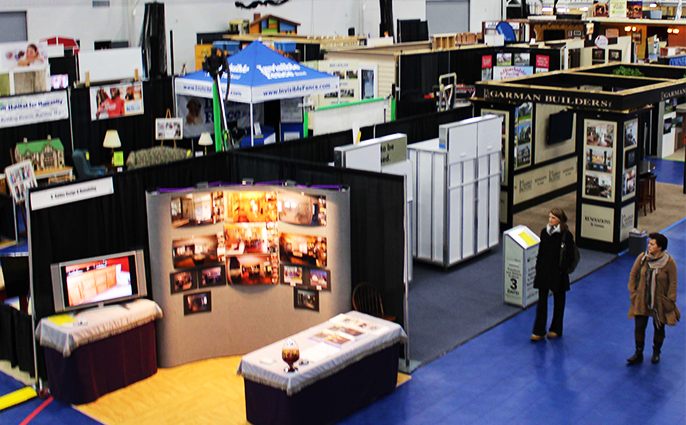 We don’t just make it easy for show attendees to enjoy themselves during the trade shows we host at our location. We also make it simple for vendors to deliver the supplies necessary to make your event a success. We have numerous loading and unloading areas that make pickups and deliveries a breeze for vendors. To find trade show conference meeting space near Lebanon, PA that can accommodate groups of all sizes, all you have to do is visit Spooky Nook Sports. To arrange a tour of our trade show conference meeting rooms, give us a call, contact us online or stop by Spooky Nook Sports today.